Are you traveling to Maryland from out of town? Here is some information that will be helpful as you plan your trip! Fr. Erik Arnold—speaker for Discovering Christ, Following Christ, and Sharing Christ—is pastor at Our Lady of Perpetual Help. Through the years, the parish has seen great fruit from running the ChristLife process. We have blocked a limited number of room at the following hotel. Once the block is full, we are not able to add additional rooms. Approximately ten minutes away from the parish. Shuttle service to OLPH is available at the hotel, but individuals must make arrangements with the hotel to utilize this service. Make a reservation online or by calling 410-997-8555 with code “CMC”. Approx. 4.5 miles from conference location. Approx. 6.0 miles from conference location. Approx. 3.2 miles from conference location. Approx. 4.7 miles from conference location. 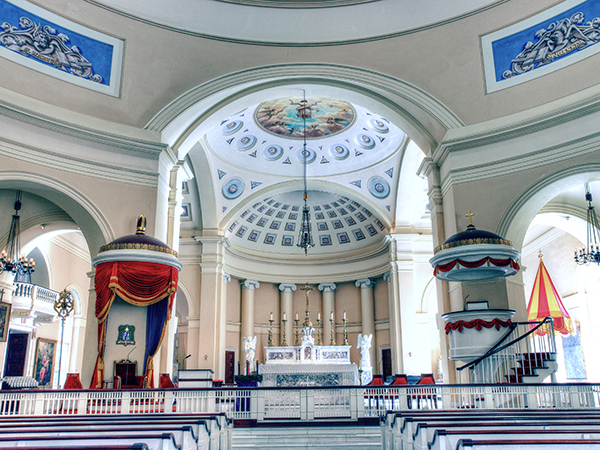 The Basilica of the National Shrine of the Assumption of the Blessed Virgin Mary, also called the Baltimore Basilica, was the first Roman Catholic cathedral built in the United States. 30-minute drive from the hotel. The Baltimore Inner Harbor is home to many popular attractions, including the National Aquarium, Maryland Science Center, and Top of the World Observation Level. 20-minute drive from the hotel. Columbia Lakefront, situated on a lake, is a nice place to relax and grab a bite to eat. There are multiple restaurants to choose from, several of which have outdoor seating available. 15-minute drive from the hotel. Historic Ellicott City is a picturesque town that is home to the oldest standing B&O railroad station, many historic sites, unique shops, and distinctive dining. 10-minute drive from the hotel.